This morning I was reading information about iOS 12 on the official polish Apple site. To my surprise, I've noticed some EVE Online assets on an iPad in one of the photos. When I clicked on the photo, my jaw dropped so hard on the floor, I'm still looking for it. 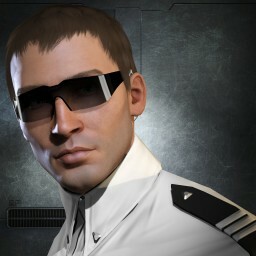 When I bought my first iPad in 2011, one of my dreams was to play EVE Online or at least a mobile game set in New Eden. Fast forward 7 years, I bought an Intel-based Windows 10 tablet, which can just play EVE Online (or any other PC game). But for Project Galaxy, I guess I should've chosen a new iPad Pro instead. In June, at Apple’s WWDC18 event, CCP Games and NetEase announced their coooperation in making a mobile game codenamed EVE: Project Galaxy. The game is scheduled to be released in 2019. It is said to be released for all major mobile platforms (so we can speculate iOS will not be the only one). Contrary to Project Aurora, which I have covered in this post about EVE: War of Ascension, Project Galaxy will be a scaled down version of EVE Online, with all core gameplay experiences like combat, mining, industrial manufacturing, trade and exploration. The game is also said to use the ARkit2.0 library, revealed by Apple at WWDC2018, which brings several new features to AR-enabled phones and tablets, such as persistent and multiuser virtual space which can now be shared across time and fixed to real-world locations, 3D object recognition, face tracking or scene reflection (ability to reflect real environment by virtual objects). More information is in the official press release on ccpgames.com. Ready to blow up some spaceships in your living room?